Get Started In Just 3 Minutes From Now! We use ClickBank's fast and secure checkout to process orders. ClickBank is one of the biggest, most trusted online retailers in the world, with 200 million customers. ClickBank protects your information with industry leading SSL (secure socket layer) encryption technology. 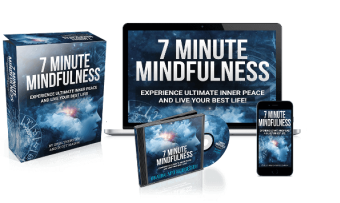 In just 3 minutes you can be using Seven Minute Mindfulness. You'll also receive an email with your login details for future reference. If you are not 100% satisfied with the program, simply email support@sevenminutemindfulness.com within 60 days for a full refund. I look forward to hearing of your success with this program. Co-creator of Seven Minute Mindfulness. Disclaimer: ClickBank is the retailer of products on this site. CLICKBANK ® is a registered trademark of Click Sales Inc., a Delaware corporation located at 1444 S. Entertainment Ave., Suite 410 Boise, ID 83709, USA and used by permission. ClickBank's role as retailer does not constitute an endorsement, approval or review of these products or any claim, statement or opinion used in promotion of these products.